The new name for the ‘coulée verte’ development has been announced. The green corridor, which will run through the heart of the city, will officially been known as the ‘Promenade du Paillon’. The municipal council of Nice has settled on the title ‘Promenade du Paillon’ after a unanimous decision at the council meeting on Friday 15th March. An appeal for a new title, launched by Christian Estrosi, Mayor of Nice, attracted various suggestions from the citizens of Nice. In fact, the poets were out in force with suggestions including Allée du petit bonheur (little lane of happiness), Symbiose fluviale (harmonious river), Val de Nice (Valley of Nice), Vague verte (green wave), and Paillonnette verte (little green Paillon). Promenade du Paillon won out over the competition with its clear connection to local history. Meanwhile, work continues on the green walkway. From the National Theatre of Nice to the Albert Ier garden, the future park continues to take shape. Ground work has been completed and channels that will feed into the ‘mirror of water’ feature are well underway. 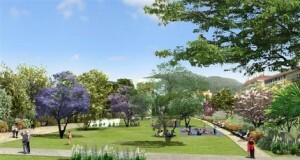 The Albert Ier garden should be delivered in June this year, as the 7.4 million euro ‘coulée verte’ project approaches its completion date in September. This entry was posted in City life - Nice, News Briefs and tagged Christian Estrosi, Coulee Verte, French Riviera, Nice, Promenade plantée.